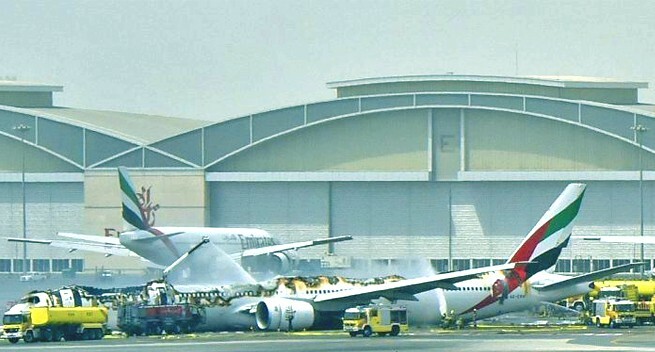 Two Australians were among 300 people safely evacuated from an Emirates plane that burst into flames after being forced to perform an emergency landing at Dubai International Airport, the airline says. All 282 passengers and 18 crew on the Boeing 777 from India were "accounted for and safe", the airline said. Thirteen passengers were hospitalised, most for minor injuries. But Emirates chairman Sheikh Ahmed bin Saeed al-Maktoum said one firefighter died during efforts to douse the flames. Sheikh Ahmed said the co-pilot was an Australian with about 7,000 hours of flying experience. He said the crash was not security-related. Photos posted on social media showed a thick black plume of smoke rising from the top of a burning plane, while the fuselage appeared to be lying on the runway with escape slides opened. Passenger Sharon Maryam Sharji said it was a "really terrifying" experience. "As we were landing there was smoke coming out in the cabin. "People were screaming and we had a very hard landing. "We left by going down the emergency slides and as we were leaving on the runway we could see the whole plane catch fire; it was horrifying." Passenger Shadi Kochuktty said: "While landing I think the engine or something burned so the smoke was coming inside so immediately they asked us to evacuate." A man waiting for relatives who were on the flight said he had spoken to them by phone. "They said they're safe and alright, but that they felt a great panic as the plane was on fire," he said. Another man said his family had also told him they were OK and there had been a problem with the landing gear. It was not immediately clear whether the landing gear was extended by the time the aircraft touched the ground, though a family of passengers who declined to be named said the wheels did not deploy and the jet landed on its belly. Sheik Ahmed said the plane had been cleared to land and added that, contrary to witness reports, "there was no fire on the plane before the incident". "The fire and what we saw was caused after the plane crashed," he said. Keith Mackey, a former airline pilot and air crash investigator, said two things struck him on seeing the burning remains of the Boeing 777. "I don't observe any landing gear at all, and that's puzzling — I wouldn't expect it to be completely knocked off, I'd expect it to see something. "And I don't see a right engine anywhere." Emirates tweeted that it was an "operational incident" but said there was no further information as to the cause. The airline said there was 226 Indian nationals on board the direct flight from Thiruvananthapuram to Dubai. Aviation safety consultant Philip Butterworth-Hayes said the evacuation effort appeared to have been handled perfectly. "It was quite extraordinary the speed at which they did it, considering the difficulties that you have when you evacuate an aircraft that size," he told The World program. "You don't know which exits you can use, you don't know whether the evacuation slides have deployed properly ... you've got to keep everybody under control ... so in terms of teamwork it's been absolutely extraordinary." Flights to and from the airport have resumed, the Government media office said, after services were suspended for several hours. Plane maker Boeing said in a statement it was monitoring the situation in Dubai and would be working with Emirates to gather more information. Dubai International is the world's largest hub in terms of international passengers, and is the base for Emirates, from where it serves more than 153 destinations.